Our hotel guests can have free drinks up to the value of parking paid at the Cathedral Car park which is on https://goo.gl/pjdS34. It’s £5.00 for 24 hours and the offer is valid for your entire stay. Please show us a picture of your pay & display ticket at the time of check in to claim the offer. 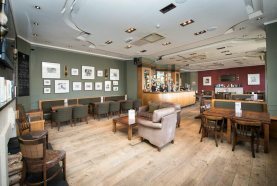 As one of the best 4-star hotel in Inverness, the Columba Hotel combines a variety of lovely rooms with a terrific restaurant and bar in a beautifully traditional setting. With natural and historical highlights in every direction, Columba’s soothing atmosphere and delightful views help make it one of the finest choices available among Inverness hotels. 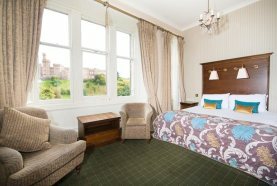 Guests at this classic Inverness hotel are treated to a wide selection of accommodation options, ranging from standard single, double & twin rooms, up to executive and family rooms. Each of these options comes with free WiFi, TV, daily housekeeping service, a tea & coffee maker and toiletries. Moreover, every room is fitted with luxurious furnishings and the peace and quiet that comes with the hotel’s convenient location in a quiet, central location. Select rooms include wonderful views over the city’s most treasured buildings and natural features, including the majestic River Ness. The crown jewel of the hotel is its very special Ness Suite, perfect for guests seeking the ultimate Inverness experience. This suite includes 2 seater sofas in main room, bathrobe, slippers, an expanded 50” flat-screen TV, Super King Size bed, separate rain shower, and plenty of other luxuries to create the perfect ambience whilst relaxing in the city. Columba’s excellent dining options include the finest seafood and country fare offered by its very own Victoria Restaurant. MacNabs Bar and Bistro has an outstanding lunch and dinner selection and a selection of beers on tap along with rich Scottish whisky to finish off a nice and satisfying meal. An outdoor terrace livens the atmosphere in the summer months, and live entertainment makes for a special treat every Saturday from March to October. This classic Inverness hotel also includes a separate lounge for enjoying afternoon tea, coffee or alcoholic drinks while reading the paper. The lounge is also a fine spot for enjoying Columba’s free Wi-Fi service. The hotel provides other features to ensure a comfortable and convenient stay in the heart of the city. As one of the best boutique hotel in Inverness, Columba also offers room service, laundry, and all the other standard amenities, along with a friendly 24-hour service at the reception desk. Parking is available nearby at an additional cost. The city’s main attractions are all close by, with Columba Hotel near Inverness Castle, the Museum and Art Gallery, the Cathedral and the Eden Court Theatre. The bus station and train station are only a short walk away, and Eastgate Shopping Centre is another easy stroll from the hotel. Other notable Inverness destinations include Bellfield Park & Tennis Courts and the city’s main football stadium, both within easy distance of the hotel. Farther afield but still accessible with public transport are Clava Cairns prehistoric site, Culloden Battlefield, Glen Ord Whisky Distillery, and – of course – the shores of Loch Ness. There are also frequent promotions and discounts available through this website, so book now to get an excellent deal. For true luxury in an unbeatable central location by the river, Columba Hotel near Inverness Cathedral provides a luxurious experience at an affordable price. Enjoy the Scottish Highlands in style with a stay at the Columba, and enjoy the very best that Inverness has to offer. 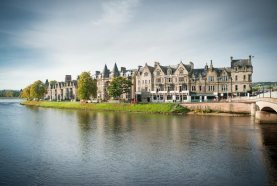 The historic Columba Hotel Inverness has 82 ensuite bedrooms (many with River & Castle views), the décor elegantly combining contemporary style and amenities with traditional comfort. The hotel boasts a perfect position in the very heart of Inverness, yet located in a peaceful area offering marvellous views of Inverness Castle and the River Ness. Guests can enjoy breakfast and dinner in our Victoria Restaurant which serves traditional English and Scottish cuisine as well as relaxing in our MacNabs Bar and Bistro overlooking the river. The Columba Hotel is in a city centre location in the Scottish Highlands city of Inverness.